Well, a couple days after we got back my legs began to show signs of something. First small welts. Then a wider spread rash, and finally a full blown mess! They itched like crazy. Poison Ivy, two weeks later! Consulting the Internet it was clear that the plants I had slept above were indeed poison ivy and my rash was a classic poison ivy rash. Today, two weeks and a day later things are improving with no open sores and most of the crust going away. but I have to say I have a new respect for poison ivy and whether my boy scout friends think it is or not, if it has "leaves of three" I will definitely let it be! 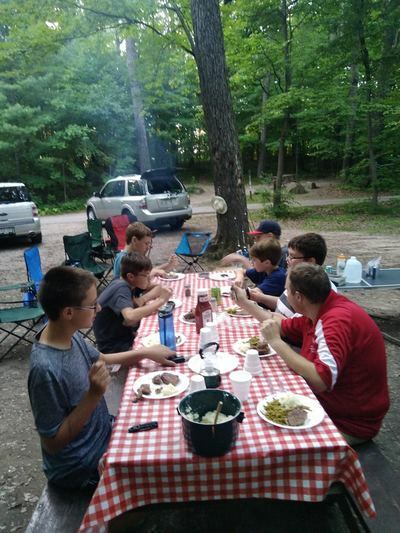 2018-07-19 This past Monday and Tuesday nights my son and I took his soon-to-be-13 year old son and six of his friends on a two night camp-out at Wisconsin's Devils Lake State Park near Baraboo, Wisconsin. If you've never been, you should go. 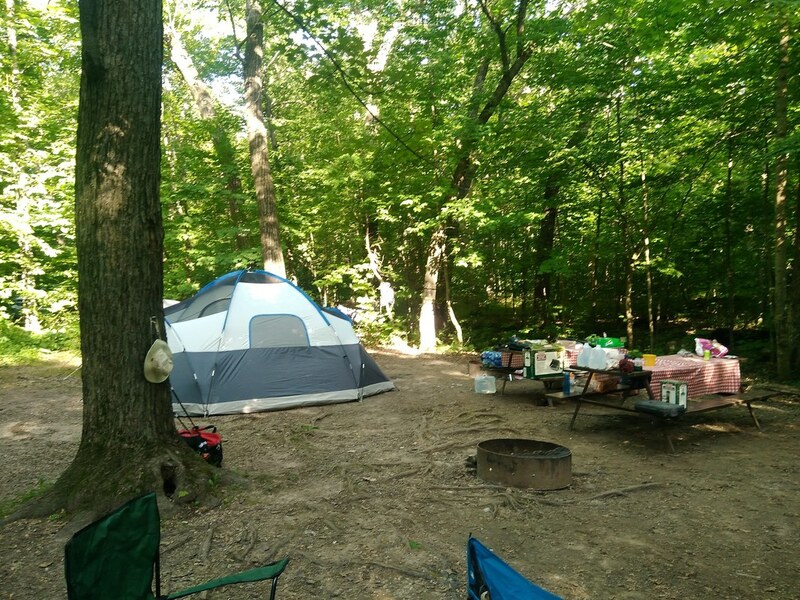 The campsites are very good, the lake is super kid friendly and if you or your kids are into hiking and climbing on huge boulders on hill sides or on the lake front, it's your place. The facilities are very good in every way. 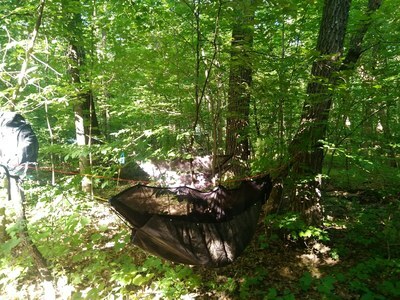 The seven boys slept in an 8-person tent and my son and I slept in hammocks in the woods immediately surrounding the campsite. 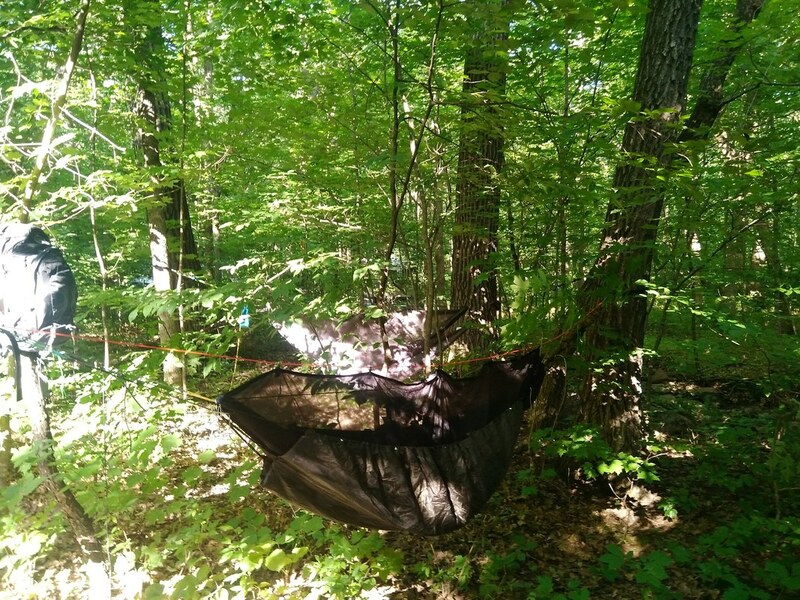 With these two nights I've now slept in my hammock "in the wild" four nights, the other two being in Michigan's Porcupine Mountains on the southern shore of Lake Superior. It was a "delightful" experience. Spending parts of three days and two overnights in the woods with seven early teen aged boys is a "trip" all by itself. They were all good boys, not a trouble maker in the crowd. But that doesn't mean they weren't spirited, entertaining, frustrating, surprising and enlightening at the same time! They all bought knives at the camp store and I believe every one of them had cut themselves with them before they got home at least once - thankfully none serious! Peanut butter and jelly sandwiches should be easy and harmless but with them nearly everything but the bread ended up with grape jelly and peanut butter on it. Frying bacon should be straight forward but some like it chewy, some like it extra crispy and one guy had the gall to ask for his to be crisp around the edges and chewy in the middle. Suffice it to say they got what we fried and all four pounds somehow disappeared - not on the ground or table like the jelly! After you listen to them talk a while you believe that they all are "really good" at something: fishing, cooking, starting fires or whatever. But after watching them "do it" for a while you learn that what they are REALLY GOOD at is talking! :-) But no matter, they are fun and inspiring and old guys like me need to be around them to learn how live in the present and get along with nearly everyone. I'd do it all again - in a year or so! And by the way, the hammocks worked out great. It took some doing to find or rather make do with the trees around our campsite but that worked out well and my son and I slept pretty well, especially the first night after the boys woke us up at about 1:00am to "chase raccoons" who discovered out trash bag which was supposed to be locked safely in a car!